Designed as a response to Vancouver's cocktail scene and their obsession with hand made, one of a kind artworks. This project combines the elements necessary to craft a classic stirred cocktail and the sustainable aesthetic of artistry. Each set consists of a 16oz mixing glass with spoon, a 1oz jigger, julep strainer, stainless pairing knife with weighted ceramic handle, muddler and citrus press. The blue grey set is made with a small amount of black dye and a white fleck while the brown set includes a dark fleck and oatmeal clay. Each is lightly glazed in an opaque white with bottoms left raw. The raw ceramic bottom means the mixing glass will not slide around while being stirred (unlike it's classic glass counterpart). Designed as a response to Vancouver's cocktail scene and their obsession with hand made, one of a kind artwork. This project combines the elements necessary to craft a classic stirred cocktail and the sustainable aesthetic of artistry. Each set consists of a 16oz mixing glass with spoon, a 1oz jigger, julep strainer, stainless pairing knife with weighted ceramic handle, muddler and citrus press. Working with clay was my initial introduction to the design world. Creating three dimensional objects with my hands has always inspired me. My experience manipulating clay is often embodied within my design process and prototyping. 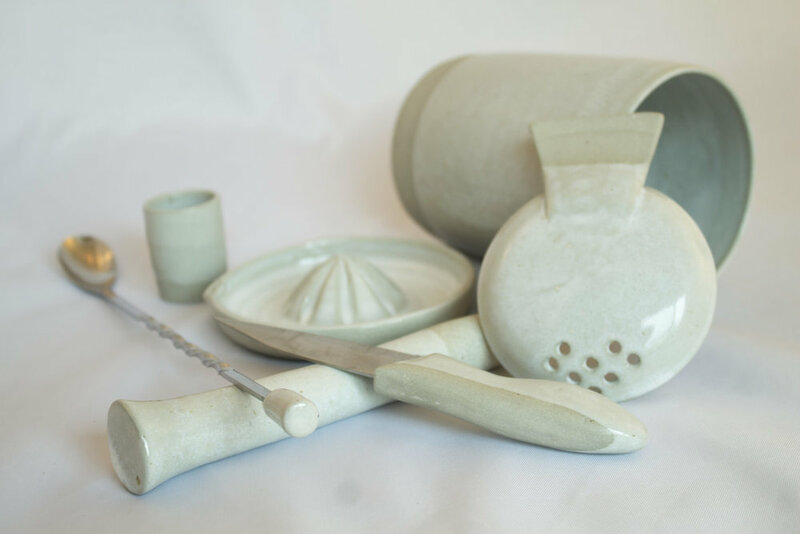 Merging together my appreciation for functional and sculptural ceramics has enabled an exciting creative process surrounding the artisan and design. The skills I’ve developed as a ceramic artist have been invaluable to my process, and progress in design. I believe there are innumerable ways these two disciplines can enhance, inspire and synthesize.